As most of you probably already know, I'm not really a fan of infused cigars, but I do smoke one every now and then. However, there is always a reason to never say "never". Along comes the Acid Subculture Progeny another Famous Smoke Shop exclusive cigar and I really enjoyed it. Why? Well not only was it a quality constructed stick, it has a great flavor mix and that won me over. This Acid Subculture Progeny starts out with a seamless, Colorado colored wrapper that contains a few smaller veins. Feeling down the body, it's packed fairly well, plus it has a closed foot and a tight triple cap. Even with the closed foot, there was an intense floral and fruity aroma radiating from the cigar. With the closed foot the cigar was a breeze to light. The first light/medium bodied puffs from the free draw contained notes of very light peppery spice mixed with sweet fruit. The fruit flavors reminded me of my favorite chewing gum as a kid, Wrigley's Juicy Fruit. 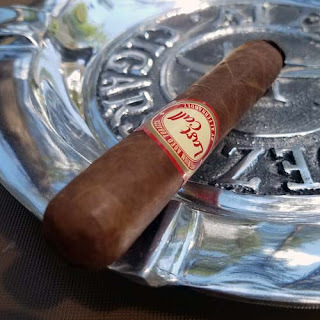 Since the cigar was infused there's not much to report as the razor sharp burn moved up the body, but there was a nice increase in spice in the final third creating a sweet and spicy medium bodied finish. You can grab these Acid Subculture Progeny Cigars from Famous Smoke Shop for a mere $4,58 each in boxes of 20. There's a good chance if you like infused cigars you'll love these! Like I said I'm not an infused cigar fan, but this was a tasty cigar.